Spring Sale at Harlem’s Katrina Parris Flowers | HarlemGal Inc.
Harlem’s Katrina Parris Flowers has some great plans for the upcoming Spring season. 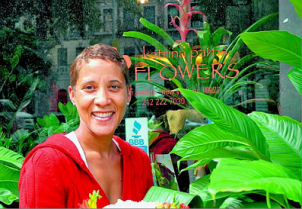 Katrina Parris Flowers, located at 191 Lenox Avenue, tells HarlemGal Inc that they are not just about flower delivery, events, and weddings. They are about being a part of the Harlem community and coming up with ideas, products and services, that benefit its customers and the community. Here are a few examples-and one of those examples is a Spring Sale. Enjoy! Katrina Parris Flowers is a collection point for Harlem Park-to-Park’s “Harlem Earth Day Bottle Cap Collection – Kids art project”. SPRING SALE is underway. 40 percent off selected gift items and 50-70 percent off gently used event inventory and vases. Plus KPF is having an online sale with 30 percent off select designs for delivery. KPF will be launching soon its LOCAL LOYALTY program, allowing customers to earn points towards free flowers with every purchase. And there is a Contest Giveaway on Facebook going on right now, to win a Harlem Love, Peace & Soul T Shirt. Stop by and visit Katrina Parris Flowers in Harlem. See details below! This entry was posted in business, Community, Harlem, Harlem blogs, Katrina Parris Flowers Harlem, Lenox Avenue, shopping, spending and tagged 191 Lenox Avenue, Harlem, Harlem Blogs, Harlem businesses, harlem community, Katrina Parris Flowers. Bookmark the permalink. I am a professional engineer have provided professional engineering services in Harlem for over 20 years. My projects include restaurants and bars, ex. 9A and The Park Wine Bar. If anyone is interested please contact me at hardiepe@aol.com or 917-376-4295.